It’s hard to believe that avocado consumption anywhere outside of California was virtually non-existent a century ago. In New York, AVOCADO TOASTS are everywhere. You can find them easily in a simple coffee shop or in the fanciest restaurant. 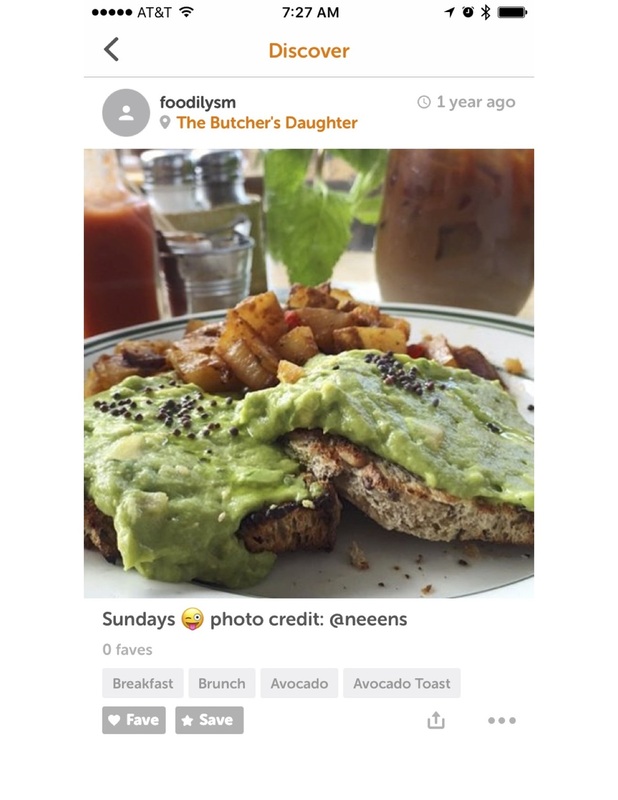 Foodfaves thinks Avocado Toast is blog-worthy enough to tell Avocado fans where to find some of New York’s best Avocado Toast! So if you crave AVOCADO TOAST day or night, are millennial or Mexican-American, check out these 6 BEST AVOCADOS TOAST IN THE LOWER EAST SIDE served all day…. yes! you read it right, ALL DAY AVOCADO TOAST in the LES…! Feel the “Avocado Passion” and download Foodfaves today! The Smashed Avocado Toast is “the house specialty” and it’s absolutely delicious. This fusion of smashed avocado, curry, cilantro leaves, mustard seeds and lime over a toasted grain bread, make it simply special! What to order: If you’re going for Brunch, Foodfaves recommends the Smashed Avocado Eggs Benedict, the perfect mixture of soft boiled eggs over this amazing avocado toast, but if you prefer, you can order just the avocado toast! Sons of Essex, atmosphere and vibe evocates the old Lower East Side (LES). Think of it as where “the old school ‘Bowery Boys’ meets the ‘Gangs of New York’.” This restaurant, fusions traditional American food with international spices and local fresh ingredients, found in the neighborhood. If you like spicy food, this Avocado Toast is a must! Their main ingredients are simple. Smashed avocado, olive oil, lemon juice over toasted crostini. The secret: the Sriracha ketchup, giving it a spicy flavor and little kick, after the first bite. What to order: The Avocado Toast is served all day! Find it as an appetizer or as a main dish in their brunch menu. With a rustic British atmosphere, this trendy eatery, in the Lower East Side serves modern British fares using only farm fresh veggies and meats. If avocado toast and veggies is what you crave, this dish is definitely for you! This mashed avocado comes with spring shoots, mixed seeds and radishes, and is served over a 7 grain toast. Absolutely healthy, green and delicious! What to order: For eggs and spicy lovers, Foodfaves recommends the Avocado and 7 Grain Toast, Spicy Eggs. But don’t worry, they have the Avocado Toast as a starter in their Lunch menu. This “Chic all-day cafe & bar” suits any occasion, serving local sourced traditional American food with an Australian twist. If you are a fan of tomatoes and salsa this Avocado toast is made just for you. The mix of smashed avocado with salsa verde and cherry tomatoes over a multigrain toast, is truly an avo-tomato perfection! What to order: The Avocado Toast ispart of the all Day Menu! But, if you’re there for Brunch, they give the option of adding a fried egg. This Eccentric art and hipster Café in the Lower East Side, not only serves coffee, it also offers you a limited variety of salads, açai bowls & pastries. This Avocado toast is what we call the “Art of Avocado”. This smashed avocado served with house sprouts, herb tahini and watermelon radish over a multigrain toast, is a perfect “piece of art” with a perfect taste. This community-focused cafe with the scent of Austrailian beaches and it's culture, creates nutritious, simple and delicious food that can be paired with amazing coffee. The simplicity of this Avocado Toast is what makes it so good! Their ingredients are very simple, smashed avocado with sea salt, lime, black peppers, olive oil and chili peppers over a Sullivan Street wholegrain Pullman toast… simply delicious! What to order: The Avocado Toast is in the all-day menu! If this list of Avocado Toast doesn’t inspire you where to go next time (or if you’re simply craving more options), this is a good time to download the Foodfaves app!